In early 2011 there was a risk that the Adur Valley would lose its local brewery and so a group of concerned enthusiasts decided to form a co-operative in order to buy the brewing assets and maintain brewing in the area. We are very proud of our co-operative which is a democratic institution run by the members and managed by an elected committee. Our aim is to brew beer along the lines of CAMRA's LocAle policy, design new beers and enjoy the social side of our business. We encourage our members, some of whom are skilled home brewers, to share their best recipes which we can then test, refine and add to our range of quality ales. Our brewery is a '5.5 barrel plant'. 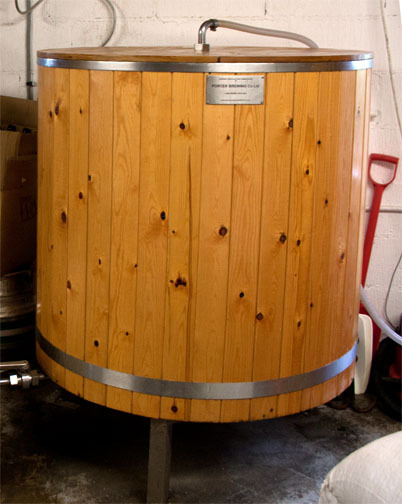 A British brewers 'barrel' is 36 gallons, equivalent to four of the common-sized casks or firkins. A firkin holds 72 pints or 9 gallons. From one brew we produce about 19 firkins, although in practice we usually bottle half of the beer. Just to confuse matters our bottles hold 500 ml, (somewhat less than a pint)! Three tanks are used for the brewing process: Hot waterfrom the 'hot liquor' tank, is mixed with pre-malted and crushed barley in the 'mash/Lauter tun'. The resulting wort is then boiled with hops in the 'copper'. After a period of cooling, yeast is added and the resulting fermentation produces beer - the very thing we're after. The brewer closely controls each stage of the process to ensure a traditional, high quality product. The beer is allowed to ferment for a period of 7 - 10 days. We have three fermentation tanks so we are able to produce three brews every 10 days or so, but in practice this period is extended to allow for cleaning, etc. Co-operative members fill bottles and firkins by hand after which they are left to condition. A brewery van ensures we are able to supply our beer to customers throughout Sussex and beyond. The Adur Valley Co-operative Limited is "an Industrial and Provident Society (IPS) operating as a bona fide co-operative". Every IPS is regulated by the Financial Services Authority (FSA). This legal status provides much more protection and stability than a PLC and the FSA does not award it lightly.